I just finished my first piece on my new table loom. I was requested to weave a hat band for someone for Christmas. I think it will look quite nice on one of his dark hats. Although I have 16 harnesses, I only used ten since I didn't feel like making up a pattern. Since I have never woven plaited twills - I selected four examples and wove them into the hat band. The loom works quite nicely. With a graceful sweeping motion of the arm, I can knock down all the levers and move on to the next threadling. It took a bit of time to get a uniform beat with that swinging beater but I got the hang of it and the patterns in the later half of the hat band are more balanced. The new loom is all put together. Only needs adjustment of the shafts so each one shifts slightly downward in order to get a good shed. The shafts are supposed to go from 50 mm to 65 mm high to achieve the best result. Since there are 16 shafts, I decided it would be easier to use those plastic texslov pins vs. tying and re-tying knots to get the right slope. I ordered them yesterday morning from Village Spinning & Weaving - and they just arrived in the mail! We seem to have the fastest mail delivery from Solvang to West LA! 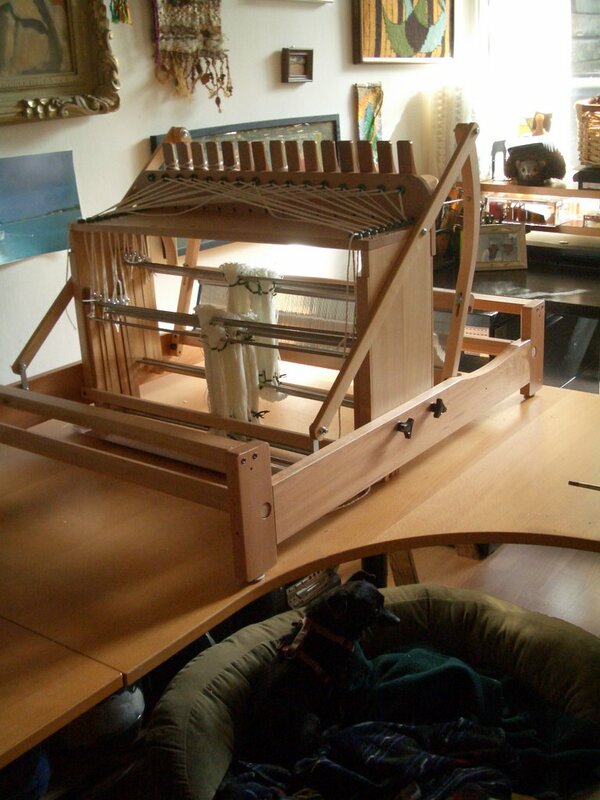 Since the loom was wider than I had imagined...the entire studio had to be re-arranged so both of my table looms, as well as the dogs, would have their 'spot'. Everything [yarn, papers, shuttles, WIP, lots of messes, books, stereo equipment, computers...] left the studio and was staged outside on the patio and in the hallway. A table was shortened and the furniture was moved around. Dust bunnies were collected. Then everything came back in or went into the trash. Took about as long to put the loom together as it did to clean the studio; the jacket took longer. Here is my new table loom - a 16 harness, twenty four inch Ashford. 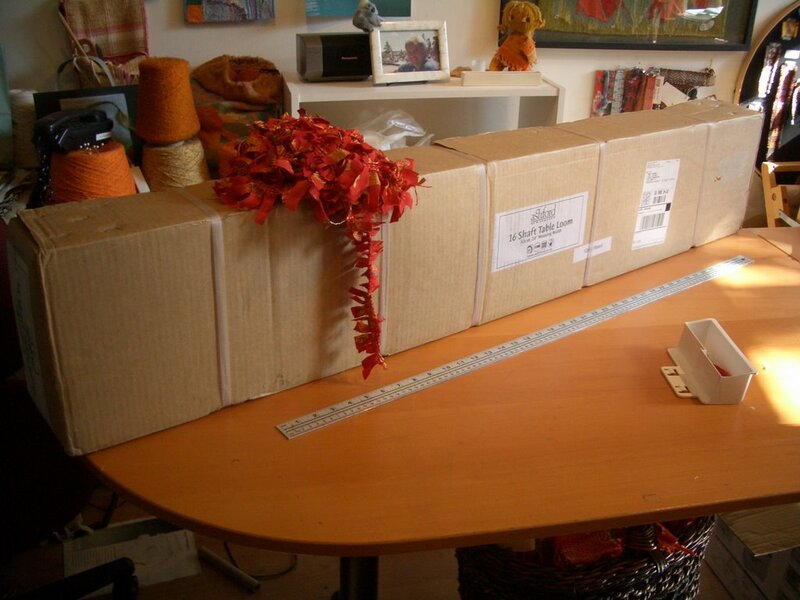 Amazingly it fits in a box which is 53 by 5 by 10 inches. I refuse to open it until I finish my jacket and put those darned sewing machines back in the closet. They always seem to have a life of their own. Jacket is proceeding nicely. Sleeves were created and attached this morning. Not perfect...but the new loom is calling...so they probably will remain as they are. Lining was finished up. Another ironing job was completed. Next step is some hand sewing of the bottom hems and sleeve lining. And then I think it may well be done...unless I find another imperfection or forgotten area which needs to be handled. Made some progress on the jacket. I spent way too long trying to figure out how to change my needle on my regular old sewing machine. Fortunately, it took me only a matter of minutes to thread four bobbins on my serger, replace two needles and test my tension for a four thread overlock stitch. The 'pattern' I wove consisted of two pieces which would attach at the back creating the majority of the jacket. 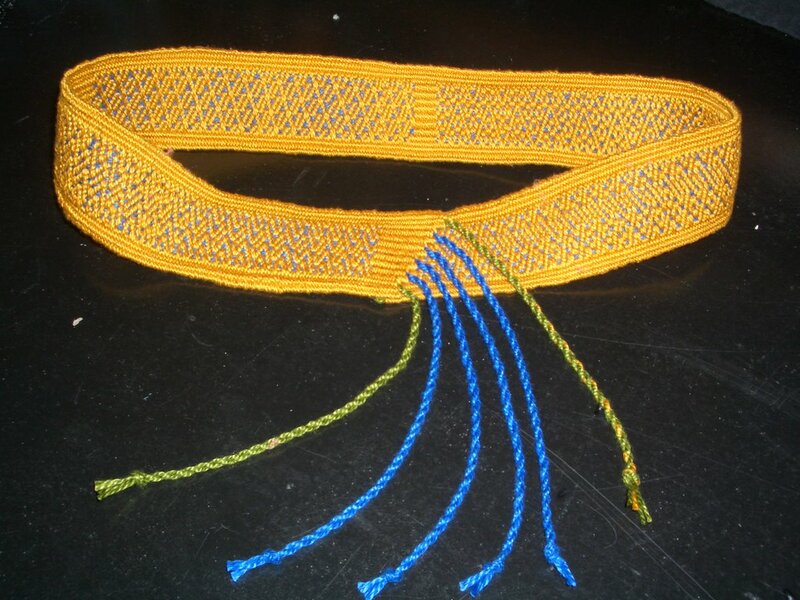 The key is to remember when weaving is that the pattern goes up for a yard, then must switch directions at the shoulder so the pattern always looks upright. I checked - all my trees are heading the right direction on the front and back so life is good. I have some extra material for pockets or cuffs on the sleeves. Here is how far I got today... The key decision was which side of the material would be the 'right' one and which would the 'wrong' one. I decided to go with the redder side. It has the yellow trees but no gold. I also spent much time musing over the lining. 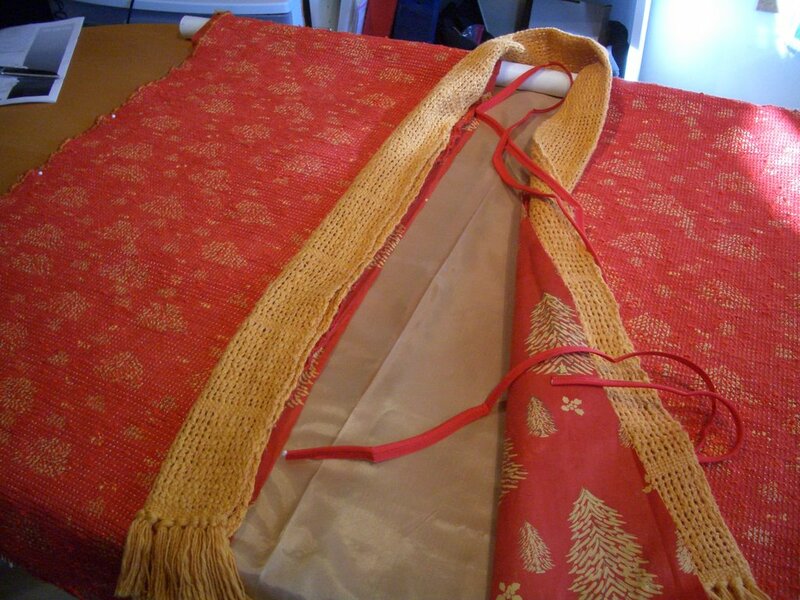 Finally, I decided to go with the tree material with the gold showing for the front and the gold silk for the back. I sewed the back and ironed the back seam. I cut out the neck hole and the extra material for the lapel. I spent much time The lining for the main part of the jacket is cut, sewn and has been pinned with the lapel of bead leno. Pinning was quite a puzzle...how to get the right side to show up where you want it. This is particularly difficult since the jacket material is only subtly different on the right and wrong sides. The lining has a similar issue. It is now ready to sew. I will wait until tomorrow just to give myself some time to consider my decisions. 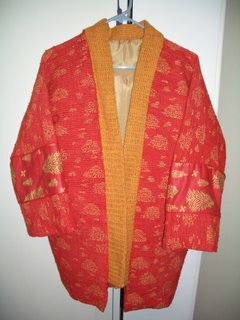 Once the lapel is sewn on - the dye is cast and the rest of the jacket just falls into place. I decided to leave out the piping on the front seam. Piping always gives a jacket such a finished look. But this time, it seems too shiny and modern for the organic nature of the lapel. Perhaps its a bit too scarlet also. I've never sewn a front seam without piping...should require less thought. Time for a brief interlude from weaving...time to whip up a Christmas jacket. Remember that material I finished weaving in August...it's time for it to become a jacket vs. a decoration on the wall. The material had little yellow and gold trees. The trees compressed after they were cut into strips and woven into the material shown in the photo. I also wove some red nubby yarn in a tabby to finish up the warp. That bead scarf should turn into a lapel. 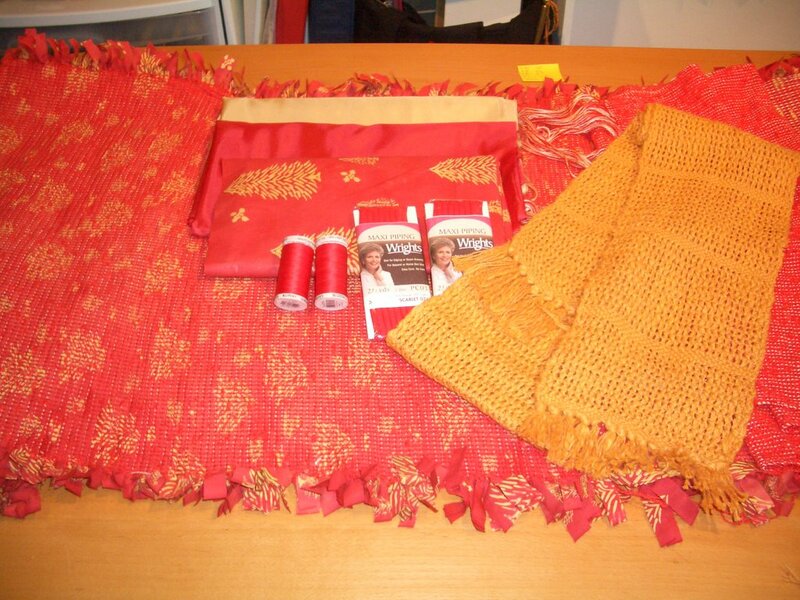 Not sure what I will do for the lining...I have three choices ... red... gold...and the actual material which I cut into strips to weave the material on the outside. I could also do a combination. And of course I have piping. What would a jacket be without piping. And pockets! This time I think I will go for side pockets. I finally broke down and decided to move up to sixteen harnesses...so I had to make some room in my studio for the new arrival. I decided it was time the eight harness table loom which I used to weave my yardage for the Great Lengths Exhibit to return home to its rightful owner. Of course, as my Mother always said. 'one never should go home naked' So, I searched my stash for the appropriate covering and got to work. 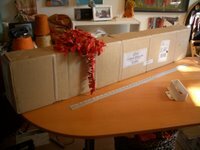 Here is the loom...all dressed up and ready to go home after a year of living in my studio. 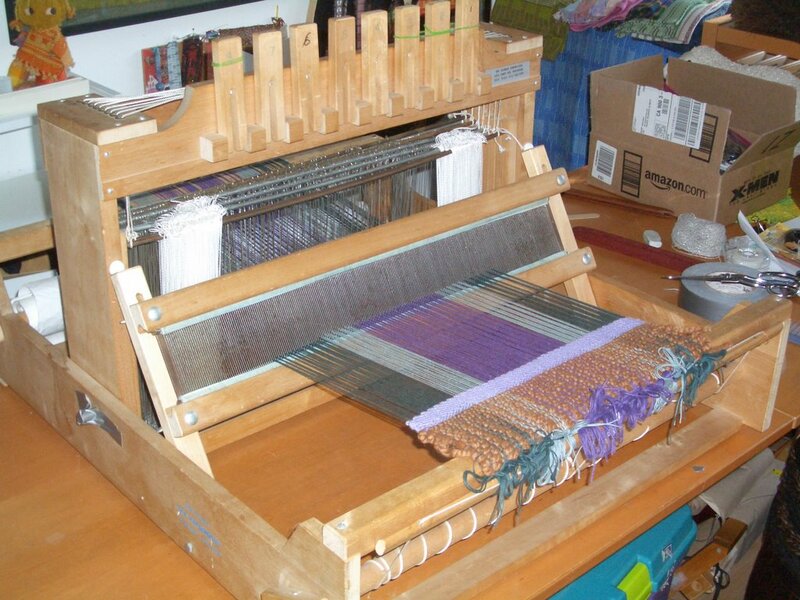 It's a loom with great personality and poise that deserves to be used. It is quite adaptable too - I was able to weave many yards of material with a sprained ankle and one couldn't tell from the finished piece that I had been on crutches for that several weeks of weaving! Many thanks Hilda! Weave something wonderful...you go girl!